I have a form which has the old theme selected and wont let me use the new designer form. Maybe I just dont know how to do it. Please help! I've cloned your form and remove the theme in my end. You can check this cloned that I have: http://www.jotform.com/form/50075202895959. You can remove or change to default by doing the following. 1. Click the "Themes" option. 2. Choose the "Default Theme" and click "Save". 3. If the above does not work, you can try using the "Preferences"->"Form Styles". 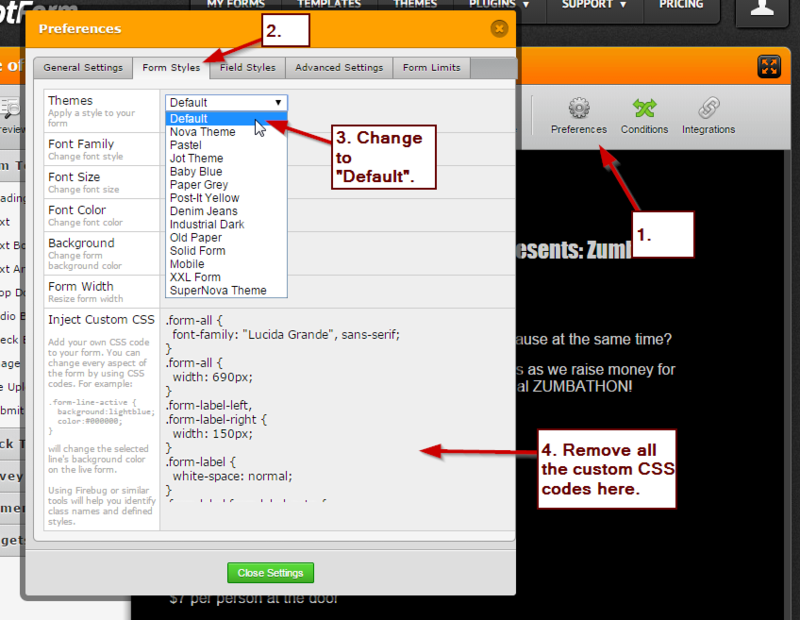 Change the "Theme" option to "Default" and/or remove the CSS codes under "Inject Custom CSS". 4. After that save the changes and you can also try clearing your form's cache. I hope that helps. Let us know if this works. Children Beyond Our Borders, Inc.
You're welcome. If you need any assistance again please do let us know by opening a new thread here in the forum.